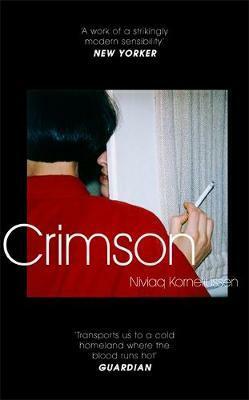 Crimson, originally titled Home Sapienne, is the story of five young, queer Greenlanders negotiating their existence and relationships in the small, claustrophobic world of Nuuk and social media. Stifled Fia leaves a long-term relationship and moves in for a while with Arnuk, her brother’s best friend, who seems to have lost her job and spends her time moving from one party to another. It’s spring in Nuuk and the nights are never dark; people move from one party to another as the sense of the sun never quite setting evokes both the far Northern setting and the existential state of youth, unmoored in the world. Originally written in Greenlandic and then rewritten in Danish by the author before beginning its journey into translation in French Canadian, English, etc., Korneliussen speaks of the need to rewrite it in Danish to be accessible to everyone, as not all Greenlanders speak Greenlandic. Greenlandic is a polysynthetic language, in which a whole sentence can be conveyed in one word, and Crimson is prefaced by a cast list whose names can simultaneously mean many things. Beginning with a letter to the reader and a cast of characters, names explained, evokes the explanatory notes that often prefaced nineteenth-century literature. This works beautifully in concert with the use of text messaging and hashtags to meld what may be expected from a novel about modern Greenlanders with what is a novel of Greenlanders. The intersecting storylines double back on each other, shifting the night from failure to triumph, and to connections made and lost. The isolated and connected world of Greenland’s capital and it’s inhabitants are beautifully evoked in a story I never thought to hear. As the author says, ‘I dreamed of being part of something bigger’. Crimson made me feel part of something bigger.